A question on the R-sig-geo mailing list came up that got me thinking about how much I know about coordinate reference systems (CRS) when working with spatial data in R. Turns out I know how to do the basic stuff, but it’s hard to remember how everything works together, so to aid my memory and for anyone with the question, here are some basic methods to answer the question: How do I make sure all my data is in the same coordinate system? If you don’t know what all that means, you should probably go read this before going any further. For extra credit, here is the Snyder book which includes the parameters and equations for most map projections you are likely to encounter. I don’t intend to get too fancy here - for most people, working with shapefiles and geoTIFF images is plenty complicated. Looking on my laptop, I have some suitable data that appears to be distributed with the OSGeo Live! 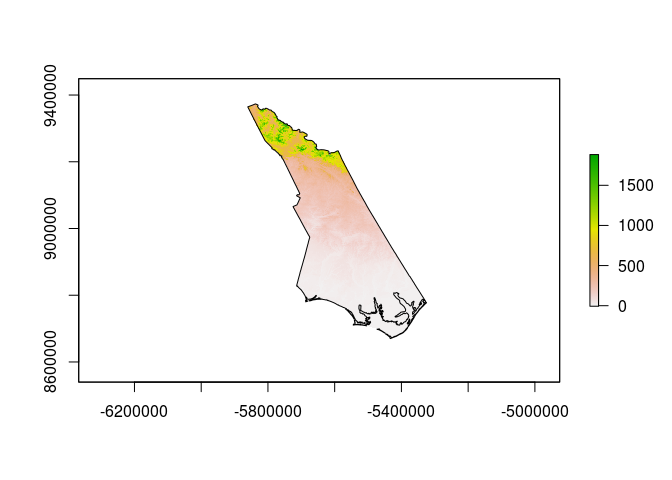 distribution, specifically the North Carolina datasets that appear to have been originally published with the book Open Source GIS: A GRASS GIS Approach. The data may be downloaded directly from the support site for that book as well. I’ll load the state boundary from a shapefile, and a low resolution DEM as a geoTIFF. Note the way a shapefile is loaded using readOGR, you have to give the directory and the name of the shapefile (without the extension) as two separate parameters, whereas the raster loader just wants a path to the geoTIFF file. ## Source: "/home/dave/data/north_carolina/shape/", layer: "nc_state"
Each of the objects created above will have a CRS definition that we can look at in various ways. ##  "+proj=lcc +lat_1=36.16666666666666 +lat_2=34.33333333333334 +lat_0=33.75 +lon_0=-79 +x_0=609601.22 +y_0=0 +datum=NAD83 +units=m +no_defs +ellps=GRS80 +towgs84=0,0,0"
Note the very different appearance - this is what we would expect when changing to a radically different projection.